Chocolate is one of the world’s favourite foods but growing cocoa is a hard task. Ninety per cent of the world’s cocoa is grown on small family farms by about 6 million farmers who earn their living from growing and selling cocoa beans. Cocoa trees grow in tropical environments, within 15 to 20 degrees latitude from the equator. The ideal climate for growing cocoa is hot, rainy, and tropical, with lush vegetation to provide shade for the cocoa trees. The primary growing regions are Africa, Asia, and Latin America. The largest producing country by volume is Côte d’Ivoire, which produces around 40% of global supply. Cocoa is a delicate and sensitive crop, and farmers must protect trees from wind, sun, pests, and disease. With proper care, cocoa trees begin to yield pods at peak production levels by the fifth year, and they can continue at this level for 10 years. But for all this hard work, cocoa farmers gain very little from a very profitable global cocoa trade. 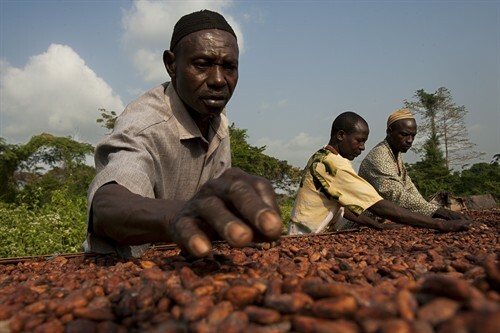 Fairtrade helps to make cocoa farming in places like Côte d’Ivoire and Ghana more sustainable through payment of the Fairtrade Minimum Price and an additional Fairtrade Premium to invest in business or community projects so farmers can better provide for themselves and their communities. 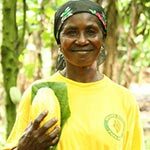 In 2011-12, cocoa farmers earned more than £7.5 million in Fairtrade Premiums and a large part was invested in directly supporting farming families meet their daily needs. Kuapa Kooko is located in Kumasi, at the centre of the cocoa growing region in the West of Ghana.